Looks are not everything. 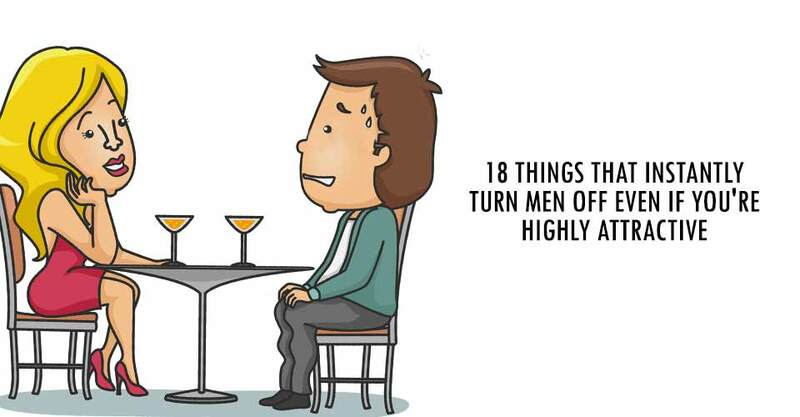 there are actually a few things that can instantly turn someone off, even if you’re highly attractive. There is nothing wrong with taking care of yourself and putting an effort into your appearance. But if you think for one moment that all it takes to drive a man wild is to simply “look good,” you’ve got another thing coming. 1. When you only notice, or talk about, the negative things in your life and completely ignore the positive. 2. When you say you are a good sport, but end up being the absolute worst person to be around if you lose. 3. When you look at other guys but rarely acknowledge the man in front of you. 4. When you look at every other woman as competition, or with jealousy in your eyes. 6. When you are super nice to your friends in front of them, but talk smack behind their backs. 7. When you can’t hold a conversation with him about anything important, or relatable. 8. When you define your level of happiness by how much something costs. 9. When you refuse to set goals for yourself or try to better your life. 10. When you deny how you feel and refuse to talk about things by using phrases like, “I’m fine” when you’re clearly not. 11. When you give ultimatums because things didn’t go your way, or you didn’t get what you wanted. 12. When you fight with him over everything. 13. When you belittle him in front of his friends or family. 14. When you make fun of something he truly enjoys, like ska music or cheesy films. 15. When you refuse to make an effort to get along with his family or friends. 16. When you appear disinterested during conversations by repeatedly looking at your phone. 17. When you only talk about yourself, or gossip about others. 18. When you don’t realize your own worth.